In 2016, then-Secretary of Defense Carter put Russia at the top of the Pentagon’s list of national security threats. His decision to rank Russian aggression above threats from China, North Korea, Iran and global terrorism was soon followed by questions about Russia’s hacking of the websites of the Democratic and Republican National Committees. As Putin’s Russia asserts itself in ever bolder ways, knowing how the story of its war-torn past shapes the present is essential to understanding its self-image and worldview. In Russia: The Story of War, Gregory Carleton proposes that to understand modern Russia we must appreciate how thoroughly the country and its people have been defined by war. From the Mongolian invasion to the defeat of Napoleon in Moscow, to the siege of Leningrad, Russia has been shaped by almost ceaseless military entanglement and vast losses of life in defense of the homeland. It has emerged from these centuries of trauma having cast itself as a benevolent power surrounded by a hostile world. Russian culture, from literature and poetry to opera and film are suffused with tales of battle. And the mantle of virtuous martyrdom has served to turn even the humiliating fall of the Soviet Union and devastating losses, such as the Soviet defeat in Afghanistan, into triumphs. Most alarmingly, this attitude towards war as civic religion is providing cover for recent border violations such as in Crimea and in Ukraine. Taking the long view of Russian history, Russia: The Story of War finds patterns that may help us make sense of a country that has always mystified, and often unsettled us. Gregory Carleton’s book is a salutary reminder of the narratives and images which capture Russians’ imagination. To understand Russia in the Putin era, Carleton argues in this spare, original book, one must recognize the mental and emotional outlook that near-constant war has produced. [Provides] the kind of context and nuance that is badly needed in the current climate of hysteria and conspiracy theories. 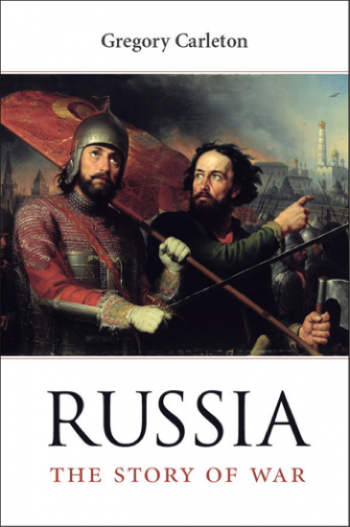 Looking back eight centuries, Carleton traces an epic tale of war and redemption, of a Russia that finds itself constantly at risk of barbarian invasion and annihilation and yet manages, time and again, to save both itself and its neighbors… Russia: The Story of War…make[s] clear why Russia has been so infuriated by U.S. policy toward Ukraine and Georgia.